Seed Global Health teaches and trains physicians, nurses, and midwives to help save lives and improve health in Africa. Our volunteers work with local partners to teach critical skills, improve health care outcomes, prevent global health threats, and save and improve lives. Seed places volunteer visiting faculty from the U.S. into medical and nursing teaching roles in Liberia, Malawi, Swaziland, Tanzania, and Uganda, building the capacity of future practitioners and their clinics, communities, and country health systems. 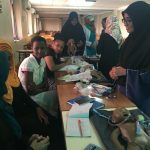 Led by seasoned medical and nursing experts, Seed volunteers teach students in the classroom and at the bedside, working alongside local faculty on academic curricula, course design, and teaching techniques. Skilled providers are the backbone of health care systems. And Seed Global Health believes in a future in which every country has a robust health workforce that is able to meet the health needs of its population. Strengthening the health workforce helps ensure that a broad range of health needs – including maternal, newborn, and child health care (MNCH) and treatment of non-communicable diseases (NCDs) – can be effectively met by country health systems. From core clinical skills to more advanced practices, Seed strengthens in-country health professional education to help the next generation of health providers meet local needs. 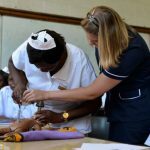 By teaching local health professionals, entire communities and countries can benefit from the “ripple effect” created when more-skilled clinicians are then better prepared to serve as educators for and alongside their local peers.